Enjoy recreation amenities such as bicycles to rent or take in the view from a rooftop terrace. Additional features at this hotel include complimentary wireless Internet access, babysitting/childcare (surcharge), and tour/ticket assistance. Make yourself at home in one of the 24 guestrooms. Complimentary wireless Internet access is available to keep you connected. Private bathrooms with showers feature complimentary toiletries and hair dryers. Conveniences include desks and separate sitting areas, and housekeeping is provided daily. Enjoy a satisfying meal at Guest Table serving guests of Villa Garance. Quench your thirst with your favorite drink at the bar/lounge. Breakfast is available for a fee. The hotel is located close to Essaouira's old town. Essaouira's beach lies 0.8 km away. It is 1.5 km away from Skala du Port and Mohammed Ben Abdallah Museum is about 2 km away. 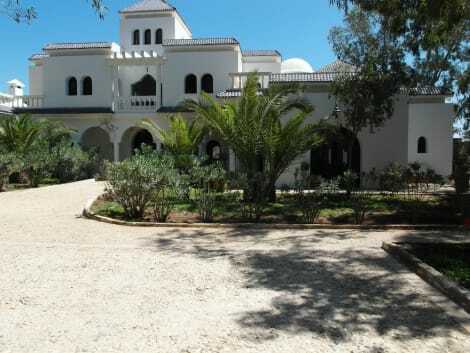 The nearest airport is Essaouira and it is within 15 km of the property. The hotel offers 23 guest rooms equipped with Internet access. It features two outdoor pools, one of which is designed for kids. There is a poolside snack bar where guests can enjoy refreshments. Furthermore, the hotel provides parking facilities for guests arriving in their own vehicles. The hotel also offers 2 restaurants. Guests can enjoy the restaurant near the pool which specializes in local cuisine, or they can enjoy the sea view restaurant on the roof which serves grilled fish and Spanish tapas. With a stay at Villa Amaryllis in Essaouira, you'll be within a 15-minute drive of Essaouira Beach and Bordj el Berod. This spa guesthouse is 6.3 mi (10.2 km) from Skala de la Ville and 6.3 mi (10.2 km) from Mohammed Ben Abdallah Museum.